August 11th, 2009 , under Website. Almost 1 year since my first post. 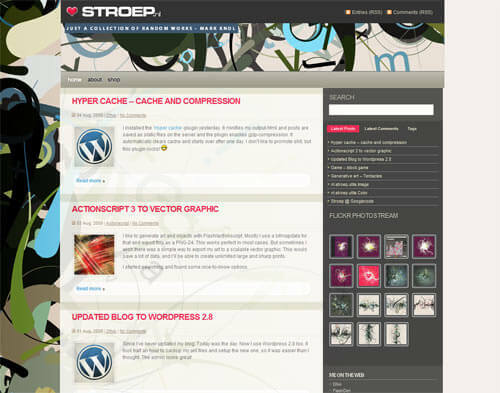 I already updated my blog to a newer WordPress installation. But since my design was getting older, I was tired looking at it. It looks a little bit messy. I think the layout (top nav, left content, right sidebar) interacts nice; so I keep this layout. But the design was a little bit overdone and I was not totally happy and I hacked multiple times layout things to it. More browsers didn’t like my site anymore. 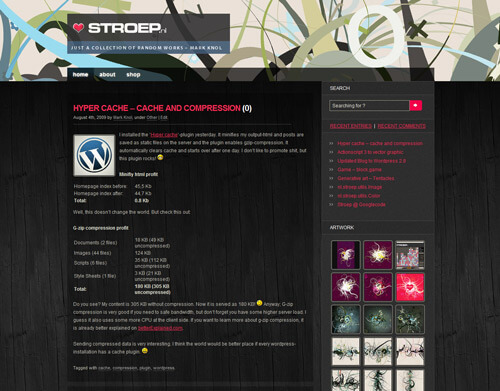 I just want stroep.nl has to look better. Last time I downloaded a theme as basic for my design and edited it. First I felt a little bit ashamed doing this. I am a designer and I can design and build my own theme. But.. I don’t have the time to reinvent the wheel of creating themes. So I don’t feel ashamed anymore. I think it’s smart using good templates as start for creating personal(!) blogs. Oops.. I did it again 🙂 I used this Linetech as start for the design. It’s a great theme. I easily modified it to my stroep-style. I love the sidebar from my previous design. You can switch between comments/recent post. So I kept this principle. I pimped my tag-cloud too. It has random colors. Don’t ask me why; I think it just looks cool and I never seen it before too btw. Speaking of random; the header images shows some random art too. I always wanted a clean dark layout with art in the header. I found some great wood-patterns. These are great because I really think this patterns make the blog more ‘friendly’ in comparison to a noisy background or a solid dark color. I know dark layouts have downsides; It’s less readable. Well for now I can live with it. The pro of a dark design is it makes art/photography look more beautiful. This blog is mostly about generative art or topics about flash related stuff, so I think its worth giving a dark design a try. I also removed 2 advertising-blocks, and just added it 1 to the sidebar. Nobody clicks it anyway. So it doesn’t have to break my new layout (yet). If someone wants to have a banner on this site (which has something to do with design/art/programming or related things), just contact me. I have about 1000 visitors a month. My blog looks better (not perfectly the same) in modern browsers. If you use IE6 you get a nice update message. My philosophy is we all need to stop supporting old crappy browsers and notify unlearned or conservative users. I used transparent PNG’s, rounded corners with CSS, and all without any fix for browsers who doesn’t support it. For my blog I don’t care and to be honest I feel forceful not having to support ‘them’. Hope you like it! Let me know what you guys think.